Looking up at the Moon at night, Earth’s closest neighbor appears in shades of gray and white; a dry desert in the vacuum of space, inactive and dead for billions of years. Like many things, though, with the Moon, there is so much more than what meets the eye. 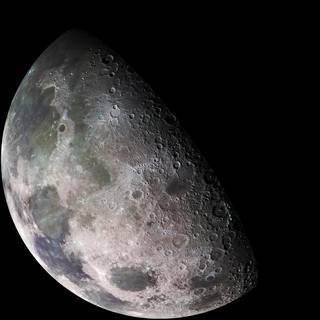 Research completed by NASA Marshall Space Flight Center planetary volcanologist Debra Needham in Huntsville, Alabama, and planetary scientist David Kring at the Lunar and Planetary Institute in Houston, Texas, suggests that billions of years ago, the Moon actually had an atmosphere. The ancient lunar atmosphere was thicker than the atmosphere of Mars today and was likely capable of weathering rocks and producing windstorms. 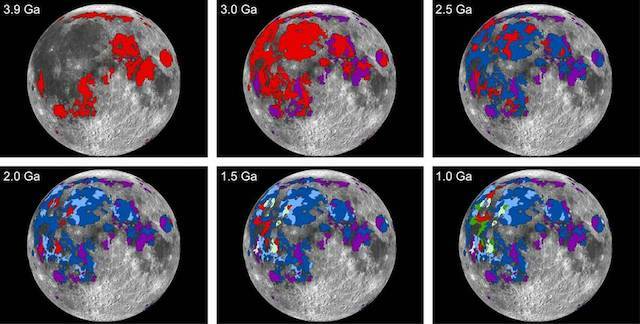 Perhaps most importantly, it could be a source for some, if not all, of the water detected on the Moon. Needham presented the research at the annual Geological Society of America conference in Seattle on Oct. 22. The research paper, available online, will be published in the Nov. 15 issue of Earth and Planetary Science Letters. Discovering the existence, thickness and composition of the atmosphere began with understanding how much lava erupted on the Moon 3.9 to one billion years ago, forming the lava plains we see as the dark areas on the surface of the Moon today. Needham and Kring then used lab analyses of lunar basalts–iron and magnesium-rich volcanic rocks–returned to Earth by the Apollo crews to estimate the amounts and composition of gases–also called volatiles–released during those volcanic eruptions. The short-lived atmosphere–estimated to have lasted approximately 70 million years–was comprised primarily of carbon monoxide, sulfur and water. As volcanic activity declined, the release of the gases also declined. 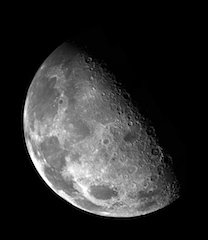 What atmosphere existed was either lost to space or became part of the surface of the Moon. 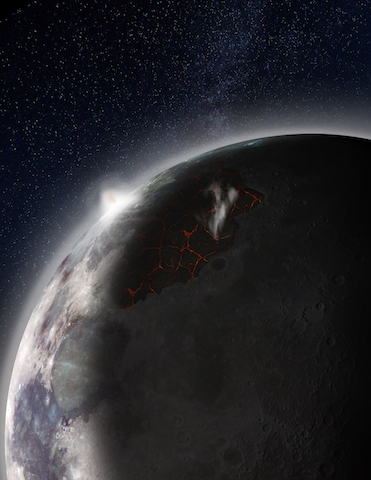 The researchers discovered that so much water was released during the eruptions–potentially three times the amount of water in the Chesapeake Bay–that if 0.1 percent of the erupted water migrated to the permanently shadowed regions on the Moon, it could account for all of the water detected there. “We’re suggesting that internally-sourced volatiles might be at least contributing factors to these potential in-situ resource utilization deposits,” Needham said. Water is one of the keys to living off of the land in space, also called in-situ resource utilization (ISRU). Knowing where the water came from helps scientists and mission planners alike know if the resource is renewable. Ultimately, more research is needed to determine the exact sources. The first indication of water on the Moon came in 1994 when NASA’s Clementine spacecraft detected potential signatures of water-ice in the lunar poles. In 1998, NASA’s Lunar Prospector mission detected enhanced hydrogen signatures but could not definitely associate them to water. Ten years later, NASA’s Lunar Reconnaissance Orbiter and its partner spacecraft, the Lunar CRater Observation and Sensing Satellite (LCROSS), definitively confirmed the presence of water on the Moon. That same year, in 2008, volcanic glass beads brought back from the Moon by the Apollo 15 and 17 crews were discovered to contain volatiles, including water, leading to the research that indicates the Moon once had a significant atmosphere and was once much different than what we see today. Casting one’s eyes at the Moon or viewing it through a telescope, the surface of the Moon today gives but a glimpse into its dynamic and complex history. Recent findings that propose Earth’s neighbor once had an atmosphere comparable to Mars’ continue to unravel the lunar past, while prompting scientists and explorers to ask more questions about Earth’s mysterious companion in the solar system. To learn more about Marshall’s lunar and planetary science research visit: https://www.nasa.gov/centers/marshall/solarsystem.html. To learn more about NASA’s research for solar system exploration visit: https://sservi.nasa.gov/.